We feel immense pleasure to introduce ourselves as an enterprise engaged in replacing spares of AIR & Gas Compressors specially (Oxygen, Nitrogen, CO2, Ammonia, LPG) for Ingersoll - Rand, Dressser - Rand, Atlascopco, ELGI, C.P. Tools, K.G. Khosla, Kirloskar and any other import substitute. 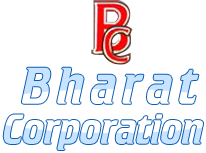 Bharat Corporation is also reckoned as one of the prominent Exporters and Suppliers of Air Compressor Spare Parts, Gas Compressor Spare Parts and Industrial Compressor Spare Parts. The company keeps very nominal profit of margin. Hence, our rates are very much competitive than others. We give guarantee for all the spares supplied by us for a period of 6 months against its quality, performance, premature failure and manufacturing defects. If given an opportunity, we assure that your yearly expenses towards air compressor spares (utility expenses) will reduce up to 250% to 300%.